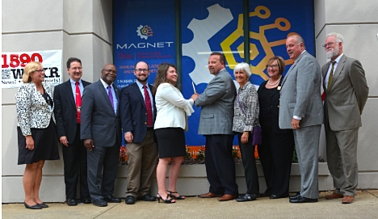 On August 8, 2018, MAGNET opened its doors to a new location at 9 North Main Street in Akron, Ohio. “We help local manufacturers grow and compete globally, and increasing our presence in Summit County is critical to achieving that mission,” said Ethan Karp, CEO of MAGNET. As MAGNET expands its efforts, the mission remains the same—to fuel Ohio manufacturing growth for lasting economic impact. With this new location, MAGNET is focused on serving the 1,300 manufacturing business of Summit and Stark counties. Grand opening attendees got a sneak peek into what that will look like. MAGNET Akron - Grand Opening Video from Akron Video Makers on Vimeo. 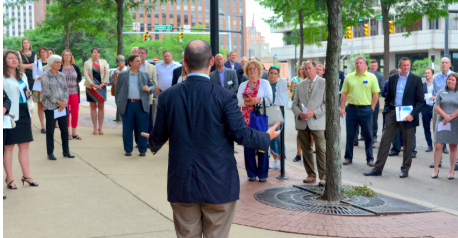 Grand opening attendees enjoyed tours of the new space, as well as interactive displays from local manufacturing businesses, such as the Akron Soap Box Derby, Technology House, GOJO and Coastal Pet Products. Looking into the future, MAGNET is hopeful to to propel manufacturing growth in Akron, across Ohio and beyond. “We can bring manufacturers the best resources our nation has to offer—experts from NASA, the University of Akron or an economic development organization like BioEnterprise. We make these connections, but we also roll up our sleeves throughout process until manufacturers reach their goals successfully and profitably,” said Darlyn McDermott, MAGNET’s market leader for the southern region. Are you ready to grow? MAGNET growth experts can help you achieve product and process excellence across your business. Contact us today for a free consultation. MAGNET's mission is to help manufacturers grow and compete in Northeast Ohio, especially the 98% of startup to medium-sized manufacturers that drive our economy. MAGNET rolls up its sleeves to provide hands-on support ranging from new product design to operations and brings education and business together to create tomorrow's manufacturers.